Skate [H5236] - $15.88 : Yarn Tree, Your wholesale source for cross stitch supplies. Cross stitch pattern by Alessandra Adelaide Needleworks. Know somebody who likes to skate? This would be a great pattern to stitch for them! 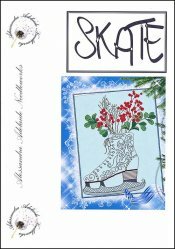 An intricately detailed ice skate is stitched with berries & leaves coming out of the top. Stitch count 199w x 248h.